Delivery 1-3 days from payment. 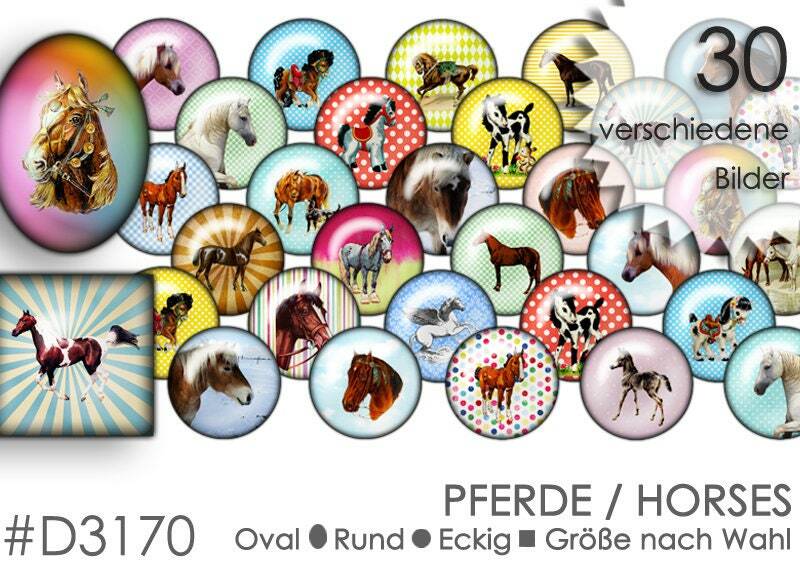 The price for the Cabochonvorlagen/button templates refers to 30 different images in a size, which are shown on 1 to 4 DinA4 sheets, depending on the size. Shipping takes place as a digital file (PDF) in high quality (at least 300 dpi) by mail. If several sizes are desired, within one purchase for each additional size/form only 2,-€ surcharge will be charged. In this case please add the article "Cabochonvorlagen +" (In the section "Additional sizes") to the shopping cart for each additional size and/or shape you want. The Cabochon or button templates are available in round, square or oval in all common sizes to match your button or jewellery blanks or individual wishes. Please specify the size of the pictures when you purchase. And please also leave a mailing address. The images are ideal for making cabochons for Cabochonschmuck, buttons, magnets, push buttons, easy buttons, chunks, pocket mirrors, Bottle openers, for scrapbooking, jewellery making, Bottlecaps or bottle caps, cards, for digital Design, production of ironing pictures and other creative projects. We work with our own photographs, various graphics, digital painting, photo collages and picture montages. As we design our Cabochonvorlagen ourselves, they can also be adapted to a certain extent to wishes. We also produce templates of images and graphics of our customers. However, depending on the expenditure, additional costs may arise, so this should be agreed before a purchase. These are digital Cabochonvorlagen (PDF); Other file formats are available on request, but require significantly larger storage space! The files can be printed (also several times) themselves. We are happy to provide further information and processing tips on request. The delivery of printed collage sheets is also possible, but causes additional costs (material and shipping), please ask if necessary. The copyright for the images remains with Planet Mallika. It is, of course, permitted to use them for craft jewellery production or for other creative works in small editions (approx. 100 pieces). However, it is not permitted to reproduce the images as such, to disseminate them further, to sell them and/or to issue them as a design of their own. If you have any questions just send us a short message, we'll answer as soon as possible!